The Highest Anti-Terrorism Effort, or H.A.T.E. 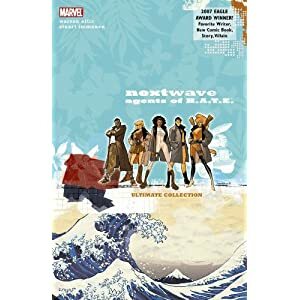 (a subsidiary of the Beyond Corporation) put NEXTWAVE together to fight Bizarre Weapons of Mass Destruction. When NEXTWAVE discovers that H.A.T.E. and Beyond are terrorist cells themselves, and that the BWMDs were intended to kill them, they are less than pleased. In fact, they are rather angry. So they make things explode. Lots of things. And that’s only the beginning!